Try infusing fennel slices and muddled or hand-torn mint leaves, then chill the mixture overnight. The natural sweetness of fennel pairs perfectly with the coolness of mint leaves. If you don’t eat a lot of fennel, do not fear it! Fennel is delicious and makes a great flavor when used in infused waters. I often buy whole fennel at the market to 1) use a few slices of the bulb in an infused water recipe, 2) roast the bulb, and 3) use the fennel tops in infused waters or salads. 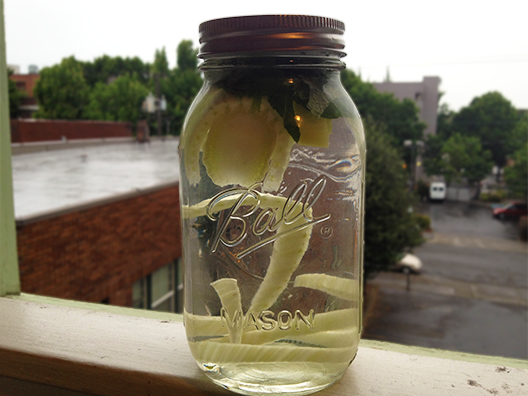 Recipe for a 32 oz Ball jar : .5” slice of fennel bulb and 6 mint leaves, torn to release flavor. Infuse for 4-6 hours in the refrigerator. Strain before serving to avoid getting mint pieces in your mouth. Hi Amy! I am new to the fruit infusions and have a question about spices. I know that cinnamon sticks will add the flavor without the cinnamon powder floating in the water. But, could I use other whole spices as well? I was thinking about a recipe with starfruit, oranges, and whole star anise. Would that actually work in this application?